When learning to play guitar one of the most important aspects is to learn how to practice. In this lesson I'm going to demonstrate the perfect practice session. This is just an example of a practice session. What you actually practice will vary depending on your level and what you working on. I find it helpful to see an example and I'm hoping you do also. This is a session for beginner learning guitar and is meant to be approximately 30 minutes long. I normally practice for quite a bit longer than that, and if you have been playing for awhile you may want to practice for at least an hour a day. Since this session is an example for beginners I'll keep it at 30 minutes. Get situated in your practice space (you do have a practice space set up don't you?). Make sure you have your tuner, picks, strap and your metronome handy. Go ahead and do a few stretching exercises to get your fingers, arms and shoulders limber. If you have a tendency to get a sore back like I do you may want to stretch your back also. Set your timer for 30 minutes and get started. I encourage beginners learning guitar to use a structure for their practice sessions. This structure is divided into five parts. This is by no means the only way to organize your practice session but it’s a good way. Below I’ll give you a brief description of each of the sections as well as an indication of how much of the 30 minutes you should spend on each part. You can use this same formula for any length of practice session. For example, if you are practicing for one hour you would just double the amount of time in each section. For the first four sections I'll also include a video to give you an example of something you might practice in that session. Depending on your current level you may or may not find the video right for you at this time. Keep in mind it's meant to be an example. It's important to warm-up when you first start your practice session.There are many exercises you can use to warm-up, but one of my favorites for beginning guitar students is something I call the Speed Developer. Here's a Five-Minute Practice Session on the Speed Developer #2. This is the exercise I use with students who are just beyond brand-new beginner. For brand-new beginners I use Speed Developer #1. If you're not familiar with Five-Minute Practice Sessions they are basically a play-along practice video for learning guitar. Sort of like practicing with your instructor for five minutes. They are not meant to be lessons. You may want to watch this video which explains the how to use the Five-Minute Practice Session in more detail. Many of my students find them very helpful. There's more information about warming up on my post “What Should I Use to Warm-Up For Guitar Practice?“. One of the most important areas for the beginner guitar player is to learn to change chords quickly and smoothly. For that reason I want my students to practice changing chords every day. The point is to learn to change easily without having to think about it. Over time I'll have them add more and more chords to the exercises. This Five-Minute Practice Session is a good example of how to practice chord changes. This aspect can often be neglected when learning to play guitar. Many people focus on getting the physical techniques without thinking about developing their ears. By working on your ears a little bit each day in the beginning it will save you a lot of time as you progress. You'll be able to pick things up more quickly and easily. Even more importantly you'll learn to play musically instead of sounding mechanical. There are many ways to develop your ears. For beginner guitar players one of the best ways is something called By-Copy Playing. Here's a Five-Minute Practice Session to practice By-Copy Playing on the first three strings of the guitar. I start off letting you see what I'm doing in my left hand. This makes it easier and helps you get started. Towards the end of the video I give you a sample of what it's like to copy the notes without seeing my left hand. It is often difficult when you're starting out but a great way to train your ears. Just work on it a little each day. If you'd like to learn more about ear training and By-Copy Playing check out my lesson "Learning To Listen And Ear Training On Guitar: The Path To Awesome Guitar Playing". In this section you'll work on your lesson for the week. It could be a variety of things but often it's a song or some larger project that your working on to develop your guitar playing skill. This is usually dictated by whatever program you're working with, whether it's with a live guitar instructor or an awesome online guitar learning program. Here's a video to give you an example of a lesson that's a fun way to practice changing basic chords. 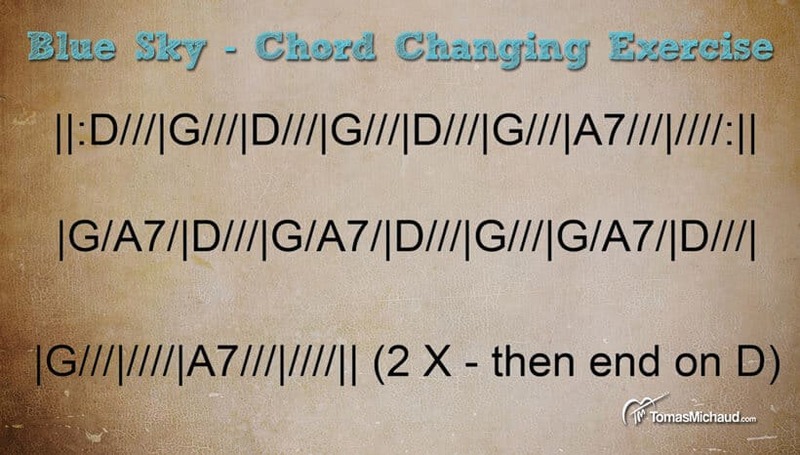 Here’s a graphic with the chord changes from the video, however it works best when you memorize the changes. At the end of your practice time you want to play for fun. This will end your practice session on a positive note and remind you of why you wanted to play guitar in the first place (what!… It wasn't to practice scales?). Once you been playing for a while it's fun to go back and play something that's fairly easy to play. You might want to pick one your favorite songs that you've learned over the last few months. Another fun thing to do is make up something. I really like my students to try their hand at creating, whether it be a song or improvising. Though I want to encourage all guitar students to play for fun I also want to remind you that it's just one part of a good practice routine. I do find students that think practicing is playing things you know already over and over. In fact you're not likely to get much better if you're not working on a progressive set of materials and learning new things. One of the most important keys to progressing is to spend some of your practice time every day focusing on improving. The key here is the word "focusing". Most people find it difficult to focus for long periods of time. One of the ways I learned to deal with this is to divide my longer practice sessions into short sessions. This is a version of a technique that I learned to be more productive in many areas called the Pomodoro technique. As you progress your practice changes. You may not practice the same thing every day, but rather practice certain techniques three days a week, and others two days a week. Also you may need longer practice sessions. 30 minutes goes by very quickly when you're working on more advanced material. I find it helpful to do many short sessions as opposed to one long session. I may go into more detail about more advanced practice techniques in a future post. Let me know if this is something you'd be interested in. Thanks the feedback Donald. I’ll add your vote to the tally. Depending on how many votes I’ll move this up or down on my list of lessons to create. You have always new ideas, and I think your help is fundamental for my progress in learning to play guitar. I am very interested in your advanced practice techniques, I’ll be waiting for your new lessons…! Thanks Sergio. I’m working on some new lessons now. I’ll keep you posted. Thank you for providing a specific track to learn and practice on. I found myself repeating what I knew and not really moving forward. Clearly not from a lack or desire to learn, rather overwhelmed with too many options and not knowing or understanding a logical progression that I could recognize my improvement. Thanks for sharing your awesome teachings.